Professional-Grade, Complete Testing Labs, that do the right job. Scroll down to browse through information on some Professional Pool and Spa Water Testing Labs. 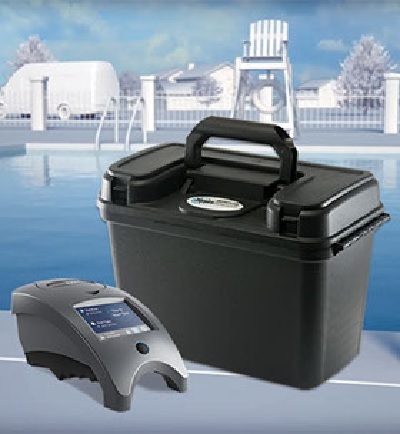 These testers are designed to meet the needs of Pool and Spa Professionals, whether it is an in-store water testing center or a portable service lab. The Website Store Directory contains an alphabetized listing of all products for sale. We don't just sell products. We help you make a better-informed choice, by providing all the information, you might require. Need ordering help? Scroll down the page, for the Order Desk Telephone Help Number. All items ordered will end up in the same shopping cart, no matter which page of this website, the items are located. All Major Credit Cards and PayPal are accepted. Order one today. All testers and replacement chemicals are guaranteed factory fresh. Includes all factory warranties. Don't settle for anything less!!! Choose from 10 models, for every pool or spa owner or professional need. No more color-matching or guesswork. Simple pictorial directions. PockeTesters are electronic, dip and read testers, that can perform a variety of important water tests: Salt, TDS, ORP, pH and more. Occasionally, issues arise that require a more specialized test: Iron, Manganese, Copper, Phosphate. Biguanide, Biguanide Shock and Salt. Insta-Test features a full-range of instant reading strips, with multiple tests, to strips for less common, but still important water test factors. We provide factory-fresh replacement chemicals and supplies, for every LaMotte tester, sold. for Pool and Spa use or other applications. We pride ourselves on Factory-Fresh Testers and Replacement items. Click any image above for product information and ordering. Scroll down for Professional Test Labs Product and Ordering Information. Click Here To Read Some Test Equipment Feedback. We guarantee that all equipment and reagents are factory fresh. Scroll down for Professional Labs specifics and to place an order. We work hard to maintain a Factory-Fresh inventory. which vary depending upon type. The use of expired reagents can affect test results. We sell all replacement items, for all the testers, sold on this website. The ULTIMATE Testers. So Fast. So Precise. So Easy. The Ultimate, Complete Professional Water Analysis Lab. Improved Cutting Edge Technology!!! A Complete set of tests in just 30-60 seconds. Use it for in-store testing mobile or commercial testing. No measuring or color matching. These are the next-generation testers. The WaterLink SPIN Labs are not shipped outside of the U.S. - No exceptions. An improved and revolutionary in-store lab or mobile pool and spa water testing capability is here! Let the innovative WaterLink® SpinTouch photometer, do all your pool and spa water testing, whether it's being done at a fixed location or done with in-the-field mobility. Just fill one unique Spin reagent disk with water and vital tests are done automatically. In just 30-60 seconds, 3-10 different test factors are completed, with no measuring, color-matching or guesswork. The test results can be viewed on the built-in touch screen or transferred, by Bluetooth or a USB cable, to connect to a PC computer, with the optional DataMate 10 software. The displayed results and precise treatment recommendations and instructions can be printed out, for further action, as required. All data is stored, for future use or referral. Instead of using the DataMate 10 software, you have the option of using Bluetooth to connect to Cloud-Based WaterLink DataMate Web, which is a subscription-based service. This is especially valuable when there are multiple stores, within the same marketing area or even with locations country-wide or world-wide. All data will be saved in the same place, no matter which store or facility does the testing. The same WaterLink SpinTouch Lab can be used in mobile applications. Used alone, it will display test results, on its touch screen. Used with the Cloud-Based WaterLink DataMate WEB subscription service, you can display information on most Android devices, as well as Apple tablets. Apple has approved the App, for connectivity to Apple Computers and Tablets. The basic differences between the in-store and mobile or commercial versions are the customized, weather-resistant carrying cases, designed for in-the-field use. The testing instrument is the same, in all configurations. Remove the disk and you are ready for the next sample or customer! This ground-breaking analysis system is so simple anyone can use it! Each sealed reagent disk contains the precise amount of reagent needed to run a complete series of tests. No measuring water, no vials to fill, no prep time, nothing to clean up and nothing to spill. Just Fill and Spin. 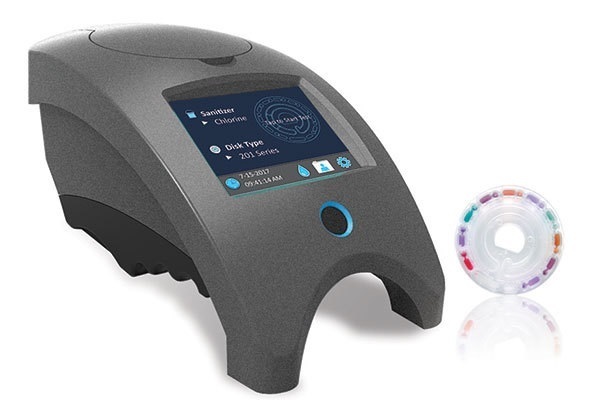 New Centrifugal Fluidics Photometry technology has made the WaterLink SpinTouch even better. The name may sound complicated, but the use and operation couldn't be easier. All you do is add pool or spa water to the disk to measure all of the tests in just 30-60 seconds. All Disks used to test for Chlorine or Bromine, also test for salt, to accommodate the needs of salt chlorine generators. It’s the most advanced system, for precise use of wet chemistry methods ever produced. Now in-store pool and spa analysts can achieve greater precision, than current water labs, without time consuming procedures or sacrificing accuracy, by using visible color-matching or test strip scanners. 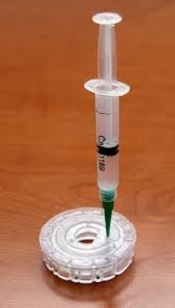 All you have to do is use the supplied syringe, to add 3 ml of sample water, and insert the reagent disk. In 60 seconds, even a testing novice, has a complete water analysis, of up to 10 different test factors. The WaterLink SpinTouch lab introduces a money-savings feature: a new Spin Disk is available that will only perform 3 tests (Free Chlorine Total Chlorine (Bromine), Combined Chlorine and pH). The same disc can be used 3 times, to test the same pool or spa, at a later time, or test a completely different pool or spa. When using the WaterLink SpinTouch with a PC, you will have the option of manually adding data on Nitrate, Manganese, TDS, Borate, Phosphate, Biguanide and Biguanide Shock, enabling you to provide an even more complete water analysis report. Click the image to see an enlarged view. The same cutting edge technology is ideally suitable for in-the-field use. This easy-to-use, portable photometer was designed for retail operators, service technicians, aquatic professionals, facility operators and any situation, that requires portability. The WaterLink® SpinTouch utilizes Bluetooth® technology to communicate with Android® and Apple Smart phones and tablet devices or can connect to the Cloud, using the WaterLink SpinTouch subscription service App. A full battery charge provides for 6 hours of operation or enough to perform 100-150 tests. If circumstances change, it can be used in exactly the same manner, as the model designed for in-store or facility use. The mobile or commercial versions include everything, except the in-store counter mat and banner, and are furnished with waterproof, custom-designed carrying cases. Click the image to see an enlarged view. For COMMERCIAL users, the #4334-H Spin Discs allow you to perform the pH, Free, Total Chlorine and Bromin e tests, on three different samples or at three different times. The NEW #4335-H Spin Discs allow you to perform the pH, Total Alkalinity, Free Chlorine and Bromine tests, on three different samples or at three different times. This reduces costs, if those are the only tests needing to be performed. If operating a commercial facility or a working in the field, this can be a helpful, cost saving consideration. The second and third test sequences must be performed, within 24 hours, or the moisture from the first set of tests will degrade the chemicals, caused a loss of accuracy and reproducibility. All other Spin Discs are single use only. In addition, to be able to use the #4334-H discs, for a second and third test run, the Spin Disc must remain in the horizontal position. The #3481 WaterLink MOBILE SpinTouch labs use a case, that flips the tester to a vertical position. This could prevent of second and third uses of the #4334-H Spin Discs. In order to accommodate the needs of commercial users, the Model #3482 WaterLink COMMERCIAL SpinTouch Lab features a different carrying case, which allows the once-used #4334-H and #4335-H Spin Disks to remain in a horizontal position, while being transported. Otherwise, except for the carrying case, the MOBILE and COMMERCIAL models are identical. Click the image to see an enlarged view. Drinking Water users. All of the above models, can be used to test Drinking Water, by going into settings and changing th e setting to Drinking Water. The reverse also applies to all the other SpinTouch models. All models use the same Centrifugal Fluidics Photometer. For the testing of drinking water, only the #4336-H WaterLink SpinTouch DW disks can be used. 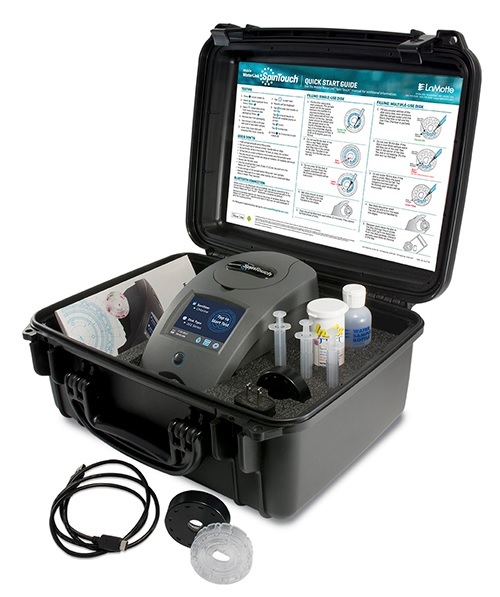 The innovative WaterLink® Spin Touch™ DW photometer does all your drinking water testing. Each sealed reagent #4336 Spin Disk contains the precise amount of reagents, needed to run a complete series of tests, including Free Chlorine (0-15 PPM), Total Chlorine (0-15 PPM), Combined Chlorine (0-15 PPM), pH (4.5-9.5), Total Hardness (0-70 GPG), Total Alkalinity (0-250 PPM), Total Iron (0-6 PPM), Ferric Iron (0-6 PPM) and Ferrous Iron (0-6 PPM). Just fill one unique Spin reagent disk with less than 3-ml of water, using the syringe that is provided, and all your important drinking water tests are done automatically—in just 60 seconds! 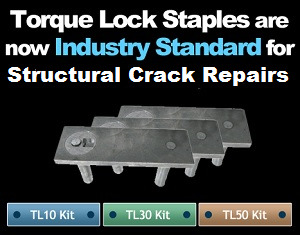 Suitable for use in testing Treated Public Water Supplies or Private Wells. No software or subscription service is required, for the Drinking Water application. 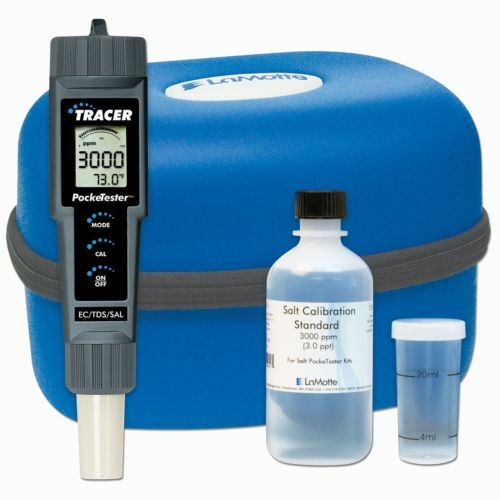 The Model #3485 WaterLink SpinTouch-DW Lab features the same upright carrying case, as used by the #3583 WaterLink SpinTouch Commercial Model, which is pictured directly above. Drinking Water Testing. 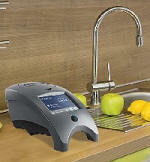 All models of the SpinTouch can be used to test drinking water, using the #4336 Drinking Water Spin Disks. Older SpinTouch units may require a Firmware update, which can be provided, by LaMotte. The original Spin Labs, models #3576 and #3577 cannot be used to perform the Drinking water tests. It's the most advanced system for precise use of wet chemistry methods ever produced. Now analysts can achieve precision without time-consuming test and clean-up procedures. This ground-breaking analysis system is so simple anyone can use it! No vials to fill, no prep time, no guessing! WaterLink Spin Disks, DataMate 10 software and a computer are not included. Five (5) different combinations of tests are available, to suit virtually all needs, with all available in packages of 50 Spin Disks. Spin Reagent Disks do the following 9 tests: Free Chlorine (0-15 PPM), Total Chlorine (0-15 PPM), Bromine (0-33 PPM), pH (6.3-8.6), Calcium Hardness (0-800 PPM), Total Alkalinity (0-250 PPM), Cyanuric Acid (5-150 PPM), Copper (0-3.0 PPM), Iron (0-3.0 PPM) and Salt (0-6000 PPM). Replacement Spin Disks are also available that perform these same 9 tests. plus either Borate (0-60 PPM) or Phosphate (0-2000 PPB). For Biguanide users, another SPIN Reagent Disk is available and does the following 8 tests: Biguanide (0-70 PPM), Biguanide Shock (0-250 PPM), pH (6.3-8.6), Calcium Hardness (0-800 PPM), Total Alkalinity (0-250 PPM), Copper (0-3.0 PPM), Iron (0-3.0 PPM) and Borate (0-60 PPM). The NEW #4334-H Spin Disk performs Free Chlorine, Total Chlorine, Bromine and pH and can be used to test 3 different water samples, for these parameters. However, the 3 uses must be done with 24 hours, or moisture and oxygen will degrade the remaining chemicals. This disk best serves the needs of retail or commercial users. All SPIN Disks have a shelf or two years. The WaterLink SpinTouch cannot be used without the DataMate 10 CD Software or WaterLink DataMate WEB subscription service, apart from reading test results on the touch screen display. Software is not required, for the testing of Drinking Water. Click to view several WaterLink SpinTouch demonstration and informational videos. How the WaterLink SpinTouch Labs work. Click to read an informative WaterLink SpinTouch PDF File. 1. Inject Water Into Disk 2. Insert Disk Into Reader 3. Click "Run Test"
Just Fill and Spin!!! LaMotte's Research and Development team spent over 7 years pioneering this new technology. All you do is add pool or spa water to the disk to measure all of the tests in just 60 seconds. It's the most advanced system for precise use of wet chemistry methods ever produced. Now in-store pool and spa analysts can achieve greater precision than current water labs without time consuming procedures or sacrificing accuracy, by using test strip scanners. PC, Apple, Android and iCloud compatible. New to the SpinTouch is the ability to add other tests to your report: such as Nitrates and Manganese. Testing ranges are wider, than other types of pool and spa testers. The WaterLink SpinTouch Mobile or Commercial Lab are battery-powered and works in exactly the same way, except that the test results can be viewed on the touch screen display or sent to The Cloud, using the DataMate WEB subscription. These items will not be shipped outside of the U.S. No Exceptions!!! Does not include the optional DataMate 10 CD or SpinTouch Subscription Service App. Spin Disks must be ordered separately. Spin Disks must be ordered separately. Does not include the optional Web Based Subscription service. The WaterLink SpinTouch cannot be used to its maximum potential, without the DataMate 10 CD Software or the optional DataMate WEB Subscription Service. TouchScreen test results are always available. 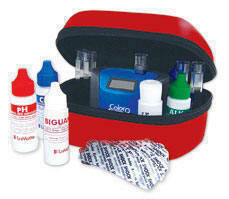 WaterLink SpinTouch Labs do not require any software or subscriptions, for drinking water testing. The DataMate 10 CD or SpinTouch Subscription service are NOT required. Spin Disks must be ordered separately. To Test Drinking Water, order the Spin Disk #4336-H, ONLY. 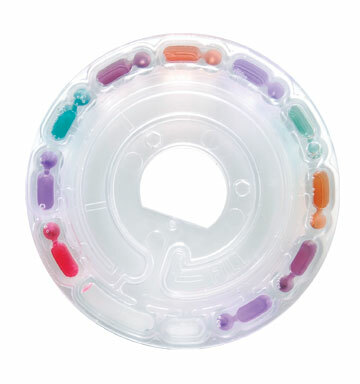 Buy any 9 packages of SPIN Disks, mix and match, and you will receive one package at no charge. Test Factor Range Choose the Spin Disk type, that best suits your testing needs. Some Spin Disks may take 1-2-weeks to ship, depending upon the time of the season. Hopefully, in most cases the orders will ship sooner. Tracking will follow, as soon as possible. * The NEW #4334-H disks can be used to perform the indicated tests, on 3 different water samples. This reduces cost, when only limited testing is required. 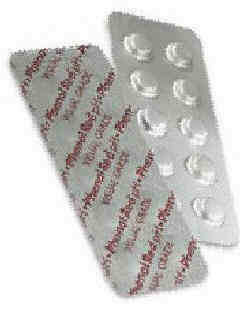 However, the 3 testings must be done within 24 hours, to avoid degradation, of the unused chemicals. This limitation best suits retail or commercial users. The WaterLink SpinTouch models are designed to use this disk. The original WaterLink Spin Labs, Models #3576 and #3577, require a DataMate Software upgrade and new spin cover, to make use of this disk. The other Spin Disks can still be used, without any upgrade, with all models. ** Testers or software, purchased before January, 2017, will require software and/or firmware upgrades to do the salt test. Replacement items, for use with all types of WaterLink Spin Disks. * Free Shipping within the Continental U.S. only. ColorQ Testing Labs offer portability and ease of testing, without any color-matching. It is all-digital. Perfect for in-the-field testing or to supplement the capability of in-store testing. Choose from 10 models, that suit every professional need. There are some tests, such as Salt, Total Dissolved Solids (TDS) and Oxidation-Reduction Potential (ORP) that can't be done with any of the above testers. That's where a PockeTester comes into its own. Dip-n-Read convenience. There are 10 models to choose from, including several made for the pool and spa professional. The ColorQ kits perform from 2-11 different test factors, depending on the model. Tests include: Free Chlorine, Total Chlorine, Bromine, pH, Calcium Hardness, Total Alkalinity, Cyanuric Acid, Copper, Iron, Biguanide and Biguanide Shock. PockeTesters offer the user the ability to perform a single test, such as pH, Salt, TDS and ORP, simply by dipping and reading. The Tracer PockeTesters feature interchangeable sensors, so that more than one type of test can be performed, with the same tester. The types of tests are expanded to include Total Chlorine and Temperature. Water Analysis is one of the keys to proper water management. Robotic Cleaners. Shown is a Pool Remote-Control model. Removes copper, iron and manganese stains and prevents a future recurrence. Salt Chlorine Generator for Spas Includes everything. No Installation needed. An easy way to clean all types of pools and swim spas. Hand-Held, Portable Vacuums, for all types of pools and spas. A Hybrid-Epoxy Coating, for refinishing Plastered or Fiberglass Pools and Spas. Hoseless Vacuums Hand-Held, Portable Vacuums, for all types of pools and spas. Skims the surface of all types of pools. Wash dirt away!!! Clean pool decks, patios, winter and solar covers and more. Seals many types of common Pool and Spa leaks, without major repair work. No Installation. For Spas, Swim Spas and Pools up to 17,000 gallons. Eight powerful magnets help control Scaling issues. 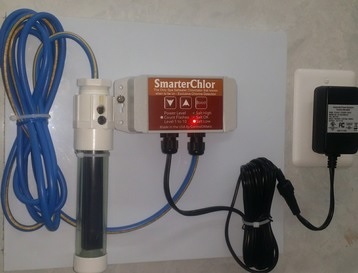 SmarterSpa is the first spa salt chlorine generator, that is smart enough, to never over-chlorinate. Detects and warns of potential electrical shock hazards, in pools and spas. Monitors Pool Activity, Safety, Water Chemistry, Environment Factors and more. Professional-Grade Aquatic Training, in any type of pool. Add a scene to your uplifted spa cover and create a great look. Premium spa thermal cover removal systems for most spas. 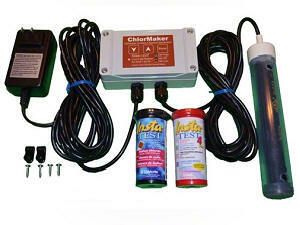 The Circulator helps eliminate dead zones, and helps control pool algae growth.